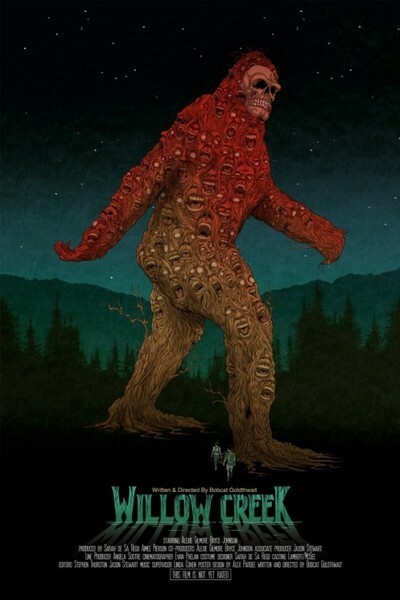 Writer/director Bobcat Goldthwait went camping and took two genres that should be at the end of their creative ropes—the found-footage movie and the monster-in-the-woods movie—with him in his latest genre oddity, "Willow Creek," now playing On Demand and in select theaters. He came back with something unexpected: a slow-burn horror flick that totally works on its own modest terms, offering an example of how well Goldthwait understands the importance of sound design and forced perspective while also offering a neat bit of gender politics and even commentary on the way we often seek that which we know we should not find. Young filmmaker Jim (Bryce Johnson) and his girlfriend Kelly (Alexie Gilmore) set out to find Bigfoot, not really pausing long enough to think about what might happen if they find him. The title refers to the infamous source of the Bigfoot legend, an entire community built up around the reports of giant, hairy creatures that roam the nearby woods and what it’s done to the tourist industry. Giant statues of the big fella, murals, stories of missing campers, songs crafted about him, etc.—Willow Creek rests on a bedrock of folklore. And not everyone seems to be happy that Jim and Kelly are here to document it. They get plenty of "this might not be a good idea" warnings, most of them echoed by Kelly herself, a woman who seems to be a passenger on a trip built as much around her boyfriend’s ego as anything. Goldthwait cleverly includes multiple takes of Jim’s little speeches and introductions to interviews. This isn’t a guy who just wants to get Bigfoot; he wants to be a star too. "Willow Creek" is a defiant slow burn. Jim and Kelly tour the community, talk to locals, and continuously prepare viewers for the inevitable. As he’s proven in films like "World’s Greatest Dad" and "God Bless America," Goldthwait is a smart filmmaker. He knows that you know that "Willow Creek" is going to get all "Blair Witch Project" eventually and so he plays with that expectation. Lesser filmmakers would have felt the need to have a sighting, a jump scare, a shock moment earlier in the film. Not Bobcat. You’re going to hang out with Jim and Kelly (credit to Johnson and Gilmore for very believable, unforced performances) to the degree that, in one of my favorite moments when Jim proposes to Kelly, you almost forget that this is a monster movie. And then Bobcat reminds you. The centerpiece of "Willow Creek" is an extended sequence that everyone making a found footage film should be forced to watch. And take notes. The camera doesn’t move. There are no quick cuts. There are no asides to the camera/audience to break the tension. We are merely in the tent with Jim and Kelly, watching their faces and, most of all, listening. What is scarier than an unexplainable, unidentifiable sound in the pitch-black woods, miles from civilization? "Willow Creek" makes the case that the answer is nothing.